Creepshow is coming back in a big way next year, with Shudder set to debut an all-new anthology series based on the popular 1982 movie from Stephen King and George A. Romero. The show will drop a big teaser at this weekend’s NYCC, but first, we get a look at the new poster, which pays tribute to the classic horror comics of the 40s and 50s. New York Comic Con is going to be quite the creepfest this October. Not only is Netflix set to debut a number of their upcoming horror titles including Chilling Adventures of Sabrina, Shudder is going to drop a sneak peak at the hugely anticipated small screen reincarnation of Creepshow. And judging from this one-sheet, it’s going to be ghoulishly scary. The Creepshow poster was designed by artist Tim Bradstreet with an assist from the show’s executive producer and director Greg Nicotero, who is not only a horror effects icon but also one of the driving forces behind AMC’s hit zombie series The Walking Dead. Nicotero, who has never been shy about visiting with fans, will be on hand for Shudder’s epic NYCC panel, which takes place this Thursday starting at 4:15 pm EST, in room 1A10. Though they have nothing to do with Creepshow, Nicotero will be joined by genre legend Joe Bob Briggs, who is getting two Shudder horror specials later this year, before he gets his own series in 2019, and Shudder curator extraordinaire Samuel Zimmerman. Creepshow got the greenlight way back in July of this year, which promised a scaled down version of Romero’s classic anthology chiller. Shudder general manager Craig Engler said this in a statement released over the summer. Nicotero went onto say this at the time, noting that he had met his makeup effects mentor Tom Savini on set of the original movie all those years ago. There will only be 500 copies of the poster being given away during NYCC. That may sound like a lot now, but these will be gone in the blink of an eye. If you’re one of the lucky few who arrive early enough to get your hands on one of these beauties, you can find the poster at Shudder’s booth, #330. 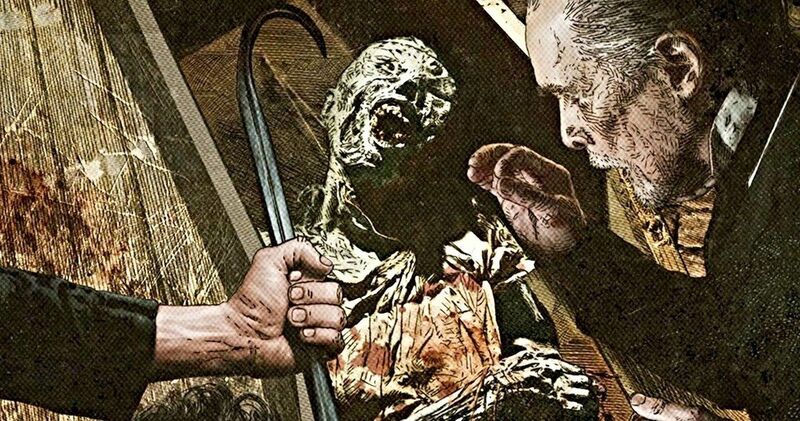 Some of theme will even be signed by Greg Nicotero, but it sounds like a limited number mixed in with the non-signed ones, so it will all be luck of the draw. Creepshow is gearing up for its big premiere sometime in 2019. You can take a look at the cool new Creepshow poster below, which arrives from Entertainment Weekly.